Precedence Date: 11/19/1923 there is no record of this dispensation. Netop Lodge merged here, 09/04/1996. William G. Hunt, 1988, 1989 MW? By Right Worshipful Henry H. Goff. This brief historical sketch of Eastern Star Lodge reminds us that Masonry is founded on spiritual truths and the dignity of man, otherwise it could not have made the enduring contributions which are essential to the development and prosperity of mankind. In this spirit, we welcome you to the twenty-fifth anniversary of Eastern Star Lodge and invite you to reminisce with us. Over one hundred and fifty years ago, in the early part of the year 1797, when Paul Revere was Grand Master of Masons in Massachusetts, a small group of men in Rehoboth began discussing the advisability of forming a Lodge in this town. On March 12, 1798, Bristol Lodge, now of North Attleboro, received, as recorded by Grand Lodge Proceedings (1792-1815 Mass., page 126), a petition from William Windsor and others praying for the establishment of a Lodge in the East Parish of Rehoboth, County of Bristol. It was voted that the prayer of the petitioners be granted. The Lodge was immediately formed and a Charter was issued. Following this, "The Grand Lodge of Massachusetts specially met at Rehoboth to consecrate Eastern Star Lodge and install its officers." It must have been a colorful event in this little town, then a tavern stop on the great Providence to Boston Post Road—the arrival of the Mail Coach bringing the distinguished representatives of the Grand Lodge; the cordial exchange of greetings with refreshments for the weary travelers; and finally the Brethren as they marched in full regalia on a glorious mission directed by the Grand Lodge of Massachusetts and assisted by the Grand Lodge of Rhode Island and Royal Arch Chapter of that State. Nature added its approval by furnishing the grandeur of a golden autumn day, with the reds and yellows of tree and shrub which provided a painted background for the first public procession of the Ancient Order in Rehoboth. After divine worship at the Baptist Church, the consecration was solemnized within the local Congregational Meeting House. That there was love, urbanity, friendly converse, entertainment and a grand feast with many toasts and songs after this important occasion, is testified to by the Grand Lodge records. Thus 150 years ago Eastern Star Lodge began its history. Thus the lessons of the gavel, hour glass, scythe and faith in immortality were emphasized to the enrichment of the lives of these pioneers in Masonic philosophy. The Lodge met in Wheaton Hall, above the Post Office, which is now the residence of Brother Ellery L. Goff. It is unfortunate that the records are inadequate, for it would be inspiring to read about the manner in which those serious, ancestral Brethren conducted the ritual and attended to the Lodge business of those long ago meetings. May it be noted, however, that the Lodge was active and that it soon acquired forty members; that on December 27,1808, Brother James Ellis of Eastern Star Lodge was appointed District Deputy Grand Master of the Fourth District by Most Worshipful Isaiah Thomas, Grand Master of Massachusetts, and reappointed to this office again in 1809. The Lodges of the Fourth District were Bristol of Norton, Fellowship of Bridgewater, Montgomery of Franklin, Eastern Star of Rehoboth, King David of Taunton and Rising Star of Stoughton. The fraternal bonds, then as now, were close because the festival of St. John was frequently celebrated jointly within the District. At this point, for a later reference, it is interesting to record that on April 2, 1798, King David Lodge of Taunton petitioned Bristol, Fellowship and Eastern Star Lodges for permission to form a Lodge at Taunton. From 1820 through the 1830s difficulties arose, too heavy for many Lodges to overcome. Eastern Star records reveal only faint information concerning this agonizing period. It is sad to relate that on December 27, 1822, the Charter of Eastern Star Lodge was surrendered to the Grand Lodge. When the Boston Temple burned, this original Charter was destroyed. For one hundred years thereafter, we find no mention of Masonry in the activities of Rehoboth. In the summer and fall of 1923, Brother Harold A. Goff drew up and circulated a petition. This petition of forty-four names was sent to the Grand Master asking that Eastern Star Lodge be reinstated. On August 17, 1923, this matter was referred to King David Lodge of Taunton and it was voted that such dispensation be granted. On January 9, 1924, the first regular communication was held at Anawan Grange Hall, Rehoboth. Right Worshipful Ralph C. Estes presided over the newly appointed officers and Brethren. In the first year, twenty-three candidates were raised and nine special meetings were held. Brother Ellery Leonard Goff was the first candidate raised. At this point the Lodge pays tribute to Right Worshipful Ralph C. Estes for his industry and tireless efforts in schooling the officers in the ritualistic work, and the knowledge of Masonic procedure and behavior. Several gifts were received by the Lodge during this period. Brother Edward Thayer presented the Lodge furniture; the officers gave the regalia; Brother John E. Waterman the Bible; Brother George Sherman the Lesser Lights; Brother Ernest G. Perry, an electrically lighted "G"; R.W. Brother William C. Ollendorff, a suitably inscribed gavel; King David Lodge, a large American Flag; Pioneer Lodge, a sword and Ezekiel Bates Lodge, a photostatic copy of the Charter. On Wednesday evening, September 24,1924, Most Worshipful Grand Master Dudley H. Ferrell opened the Grand Lodge of Massachusetts in an adjoining apartment. 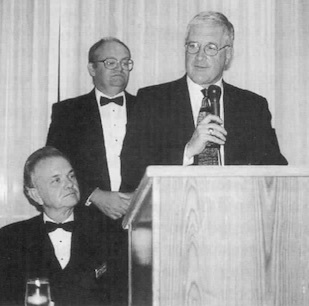 Then Worshipful Master Ralph C. Estes, Senior Warden Harold A. Goff and Junior Warden John E. Waterman retired to the Grand Lodge and notified the Grand Master that the Brethren of Eastern Star Lodge, U. D., to whom the Grand Lodge had seen fit to grant a Charter, were convened for the purpose of being constituted into a regular body. The Grand Master thereupon entered the lodge-room, and in due and ancient form, duly constituted Eastern Star Lodge. Following the ceremony, the officers of Eastern Star Lodge were installed as the first officers of this regular and duly constituted Lodge. At this time the Lodge was very active, initiating candidates and holding many special meetings, and on June 25, 1927, the Lodge took part in the parade and ceremonies attending the laying of the corner-stone of the Masonic Temple of Bristol Lodge, North Attleboro. On May 8, 1928, Eastern Star Lodge began an exchange of work with Netop Lodge of Seekonk. This exchange is being continued to our mutual benefit and happiness. On October 26, 1929, the Lodge assisted in the ceremonies at the laying of the corner-stone of the Masonic Temple of Ezekiel Bates Lodge, Attleboro. In December, 1937, the Lodge was honored by the appointment of Worshipful Henry H. Goff as District Deputy Grand Master of the 28th Taunton District. R. W. Henry Goff appointed Wor. Harold A. Goff to serve as District Deputy Grand Marshal and Worshipful Enoch A. Carpenter as District Deputy Grand Secretary. On February 1, 1938, a reception and dinner was held at Goff Memorial Hall in honor of the newly appointed Deputy and his suite. A large number participated and witnessed the presentation of the official jewel to Right Worshipful Henry H. Goff by Worshipful John E. Waterman. During 1940 a play, entitled "Judge Not," was presented in the Lodge under the direction of Worshipful Arthur C. Chaffee. This play was repeated in numerous other Lodges and also at the Masonic Home at Charlton. At this point we record the death of Worshipful Lawrence Joshua Walsh on January 7, 1928. He was the first Brother of Eastern Star Lodge to "travel to that undiscovered country." Worshipful Brother Walsh was a charter member and served as Senior Deacon in the first organization. Among the charter members who contributed much to the early success of Eastern Star Lodge was Worshipful Brother William C. Viall, who in addition to his many gifts, served a dinner to the Brethren and distinguished guests on the night of constitution. It is sad to record his death on August 29, 1943. He is the second Past Worshipful Master of Eastern Star Lodge to "travel to that undiscovered country." In December, 1946, the Lodge was gratified to receive notice of the appointment of Worshipful Harold A. Goff to the office of District Deputy Grand Master of the 28th Taunton District. Right Worshipful Brother Goff appointed Worshipful Clarence A. Saunders as District Deputy Grand Marshal and Worshipful Ernest L. Goff, Jr., as District Deputy Grand Secretary. A reception for the newly appointed District Deputy Grand Master was held March 6, 1948, at Anawan Grange Hall and was well attended by the Brethren and distinguished Masons of this and other Districts. After the dinner, R.W. Henry H. Goff presented the official jewel to R.W. Harold A. Goff and appropriate remarks were exchanged. R.W. Brother Harold A. Goff was reappointed to this office in December, 1947. In the past twenty-five years we have been honored by having R.W. Brother Harold A. Goff and Worshipful Robert G. Cooke elected Master of the 25th Lodge of Instruction. By Worshipful Charles C. Viall. Extant copies of the Providence Gazette for the years 1798-1800 attest to the existence of the Lodge in the early years of our Nation. They relate to the celebrations of the feast of St. John, the "consecration" of the Lodge, and the installation of officers in October, 1800, at the house of Mr. Goff, Innholder, situated where the Goff Memorial Hall now stands. Also, several years ago, the Certificate, dated September 29, 1804, and the lambskin of Bro. Capt. Ebenezer Hathaway came to light. Another Certificate of Bro. Allen Cole, dated 1804, has been presented to the Lodge. The Charter, attested to by Most Worshipful Paul Revere as Grand Secretary, was reputedly destroyed when the Boston Masonic Temple burned in the last century; and we read with disenchantment the records of King David Lodge that Eastern Star Lodge succumbed "for lack of interest," in 1822. This reminds us that "Man can live without Institutions, but Institutions cannot live without men." Thus, Masonry languished in Rehoboth for a century. Townsmen wishing to join the Craft were obliged to travel to King David in Taunton, Pioneer in Somerset, Ezekiel Bates in Attleboro, and later to Rising Sun Lodge in East Providence. Thus it was in 1923, under the leadership of the now Right Worshipful Harold A. Goff and 43 other Master Masons, predominantly from the aforementioned Lodges, that the Lodge was re-Chartered, after a petition recommended by King David Lodge was granted. The Lodge was instituted on December 31, 1923, and first met on January 9, 1924 under the tutelage of Right Worshipful Ralph C. Estes who presided by appointment, with Bro. Goff in the West, and Bro. John E. Waterman in the South. The first initiate was Bro. Ellery L. Goff, in whose residence the Lodge had also met in the late seventeenth century, when known as Wheaton Hall and which also had served as the Post Office. Funds for the fledgling Lodge were raised by clambakes, strawberry festivals, and ham and bean suppers; just as today we have our turkey suppers under the masterful direction of our Worshipful Master. Many of us remember with nostalgia these events and the Brothers who generously supported the Lodge. The Lodge received many gifts of furnishings and regalia. But the Grange Hall, where the meetings were held, did not provide an atmosphere of Masonry; so the Lodge and the Rehoboth Chapter, Order of Eastern Star, with liberal financial contributions, induced the Grange to make alterations and refurbish the Hall. Three steps were installed on the Master's carpet with appropriate risings at the Warden's stations. The front of the Hall was extended easterly to enlarge the anterooms, new lighting fixtures installed, running water and restrooms provided, and the kitchen and banquet hall facilities improved. The Lodge now had more commodious apartments for the practice of its rites. Through September hurricanes, St. Valentine blizzards, rationing and blackouts, the Lodge has held five hundred and six regular communications. Our last, on January 9th, coincided with the date of our first, fifty years ago. There have been many special communications to attend public worship and to celebrate St. John's Day at the Village Church, the Methodist Church in the North end, and the West Dighton Congregational Church, to exemplify degrees, and to pay our last respects to departed Brothers. In addition to the 44 Charter members, 46 have joined by affiliation, and 259 have been elected and received the Degrees and signed the By-laws. Several years ago we elected an Honorary Member: Rt. Wor. William G. Hunt, Past Master of Rising Sun Lodge #30 of East Providence, and presently Deputy Grand Master of the Grand Lodge of Rhode Island. All too many of our Brothers have passed to the Great Beyond. Most recently, in December, was our Brother Harold S. Horton, a Charter Member. Eighteen Past Masters have "travelled to that undiscovered country". Right Worshipful John F. Lowry left us in October, and in September 1969, we were deeply saddened by the loss of our Secretary, Worshipful Jason E. Waterman, Jr. after serving for only one year. Notable in our events has been the reciprocal visit with Netop Lodge in Seekonk to exemplify the degrees. This custom, started in 1928, has provided a close fraternal bond between the Lodges and the Brethren. Four Grand Masters have honored Eastern Star Lodge with the appointments of Wor. Henry H. Goff (1937-39), Wor. Harold A. Goff (1946-48), Wor. John F. Lowry (1958-60), and Wor. John L. Waterman (1971-73), to the Office of District Deputy Grand Master of the Taunton 28th Masonic District. Traveling about the District on the Fraternal and Official Visits of these Ambassadors of the Grand Master has brought much pleasure and gratification to all Masons in the area. The Lodge has also supplied Masters to the 25th Lodge of Instruction: Rt. Wor. Harold A. Goff, Wor. 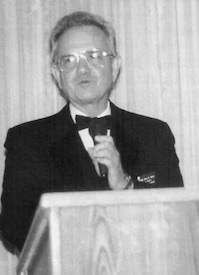 Robert E. Cooke, Wor. George W. Sherman, and Rt. Wor. John L. Waterman. Wor. Bro. Sherman also served as Secretary. Tonight, at our Golden Jubilee, we are profoundly honored by the presence of the Most Worshipful Donald W. Vose, Grand Master of the Grand Lodge of Massachusetts, the third oldest Jurisdiction in the World, ranking only after those of England and Ireland. To many of us, these have been two gala occasions long to be remembered. But the real history of the Lodge lies dormant in the archives, and locked in the faithful breasts of the Brethren. The records show the when, why, and by whom, certain actions were taken and between the points of the compasses are the memories of each Brother when he was first made a Mason and stood erect before God and Man. Most Worshipful Fred K. Bauer helped celebrate the 75th anniversary of Eastern Star Lodge together with State Representative Phillip Travis as they both spoke to a large number of members, guests, friends and relatives attending this occasion. The Grand Master spoke of the new century as being a banner century for Freemasons all over the world as our accomplishments are recognized. "Awareness" is the key. Representative Phillip Travis addressing the attendees. This page was last modified on 30 April 2018, at 14:41.